After injuries limited him to six starts, Iwakuma felt like he didn't do his job for the Mariners last season. It motivated him to re-sign with the Mariners and make a comeback following shoulder surgery. PEORIA, Ariz. — In spring trainings past, Hisashi Iwakuma’s days were planned to the minute with an almost compulsive diligence and structure. Disciplined to his craft and experienced to know exactly what he needed/wanted to do to prepare for the upcoming season, Iwakuma rarely had free moments to himself other and a quiet cup of coffee in the clubhouse following breakfast. There was always running, strengthening, stretching and drills to work on his mechanics to go with the regular on-field workouts and throwing programs. He was always doing something to get ready. For now, he’s been forced to follow a different plan — one that isn’t quite his own. After having shoulder surgery at the end of last season, Iwakuma is still working through his recovery from the procedure. And it can be a frustratingly slow incremental process. Such is the routine for a player recovering from surgery or injury during spring. While everyone else is preparing for Cactus League and later regular season games, Iwakuma is now just trying to build up enough to actually throw off the mound. According to Iwakuma, the “debridement” procedure performed by Dr. Keith Meister in Dallas on Sept. 27 was just an arthroscopic clean up to remove some scar tissues and loose bodies in the shoulder that seemed to be causing the discomfort and inflammation. “No repairs, nothing was torn,” he confirmed. The surgery capped off a disappointing 2017 season for him. Following a 2016 season where he tied a career high with 33 starts and threw 199 innings, Iwakuma started slowly last season, going 0-2 with a 4.35 ERA in six starts. He was placed on the disabled list on May 7 with shoulder inflammation and never returned despite repeated attempts that even included rehab starts with Tacoma. The regret and failures of 2017 provided the motivation to sign a minor league contract to return to the Mariners in the offseason instead for looking for another opportunity as a free agent. The process to get Iwakuma back to Seattle and pitching in regular seasons games could be a lengthy one. He is only playing catch out out to 120 feet at 70-80 percent effort. 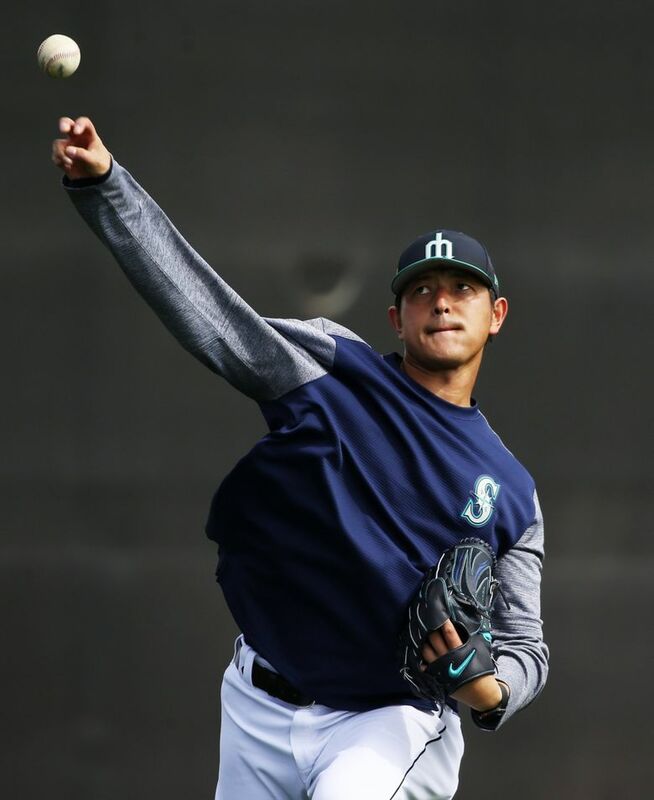 He isn’t scheduled to throw off the mound until the first week of March, meaning there’s a good chance he may have to remain at extended spring training to complete his throwing program and then pitch with Class AAA Tacoma to prove himself ready. To help aid in his recovery and performance when he returns to the mound, Iwakuma trimmed about 12-15 pounds off his frame this past offseason by conditioning and giving up rice — his favorite thing. He was never heavy, but he felt this was a necessary change. After a distinguished career in Japan followed by seven seasons with the Mariners, compiling a 63-39 record in 150 appearances and career 3.42 ERA, it’s easy to wonder why the 36-year-old Iwakuma wants to endure this uncertain path with little guarantee of getting back to where he wants to be. He admitted to considering retirement and giving his body a permanent rest from all those innings logged, but he wasn’t ready to walk away without at least trying one more time. He has his reasons.